When I tell people I'm from Texas, they usually want to know stuff like how many pairs of cowboy boots do I have, whether or not my husband drives a pickup truck and if our family is “in oil.” The answer is one, no, and don't I wish, the point being that our very big state has a lot of stereotypes, some of which are true. When people are planning a visit to Texas, odds are they're visiting one of the larger, well-known cities: Dallas/Fort Worth, Houston, San Antonio, and Austin. Nothing wrong with those cities at all, but to really get a feel for Texas, you need to venture outside the big cities and into the smaller ones. 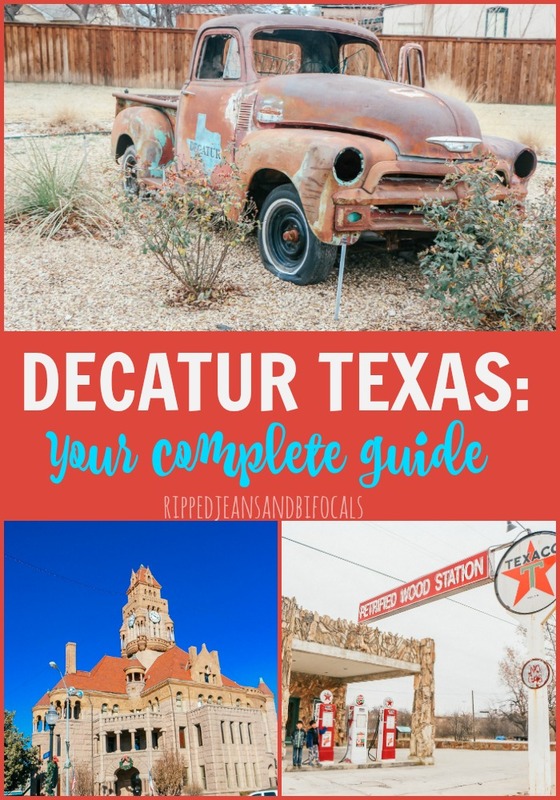 Some of my best trips have been to the smaller, lesser-known to the tourist crowd cities and towns that are just a little bit off the beaten path…like Decatur. Decatur Texas is located about 40 miles from Fort Worth…if you watch Texas Flip n' Move on HGTV, this is their neck of the woods. But that's not why you should go. Here's a list of six things to do in Decatur Texas that are pure small town awesomeness. I was hosted by DIY Studio Decatur. All opinions are my own. 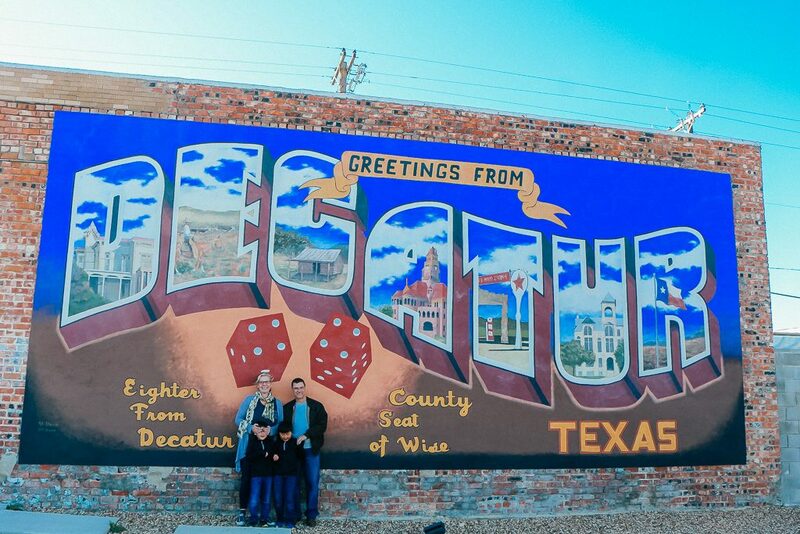 This mural is right off Trinity Street in downtown Decatur…and if you don't get your picture taken here, were you really even in Decatur? 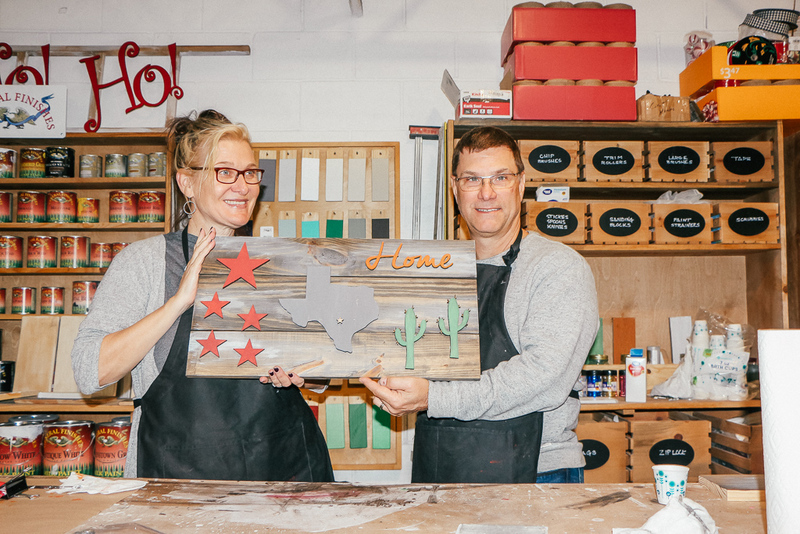 Chip and Joanna may have put shiplap on the map in Texas, driving hundreds of thousands of visitors a year to nearby Waco but if you're planning a trip to Waco to see all the DIY and crafty things, Decatur will up your ante. 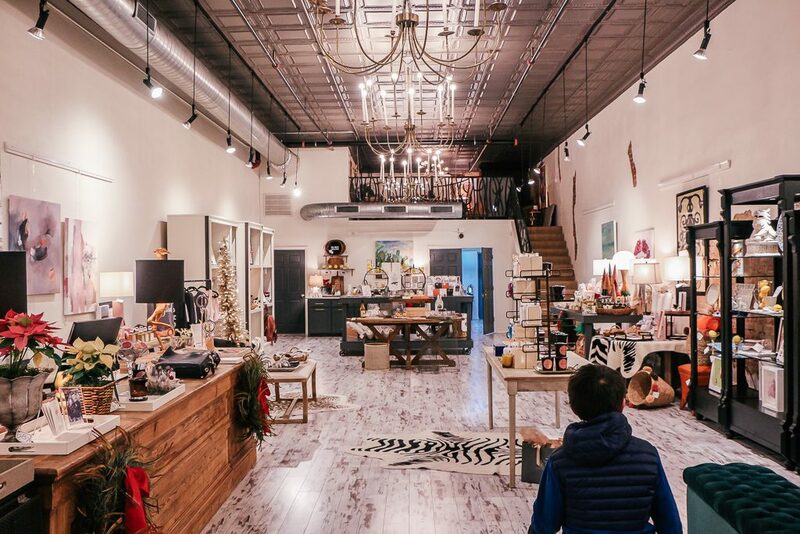 The parent company of DIY Studio Decatur Texas is a supplier to the Magnolia Market, meaning that some of the goodies you see for sale in Waco are made in Decatur. While I'm not refuting that Waco is a really fun place to visit, you can have an entirely different experience in Decatur. My kids made tee shirts to hang in their room. They had help and coaching but they did the work themselves. If you want to create something truly fun and unique, The DIY Studio Decatur Texas is your place. 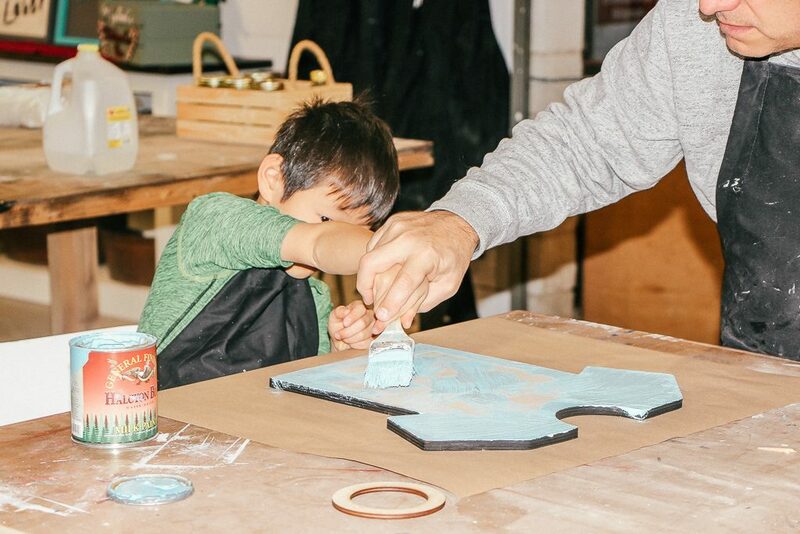 They offer classes geared toward couples (where you make one project together), families, girlfriend groups, corporate groups, and anything else you might be able to think up. 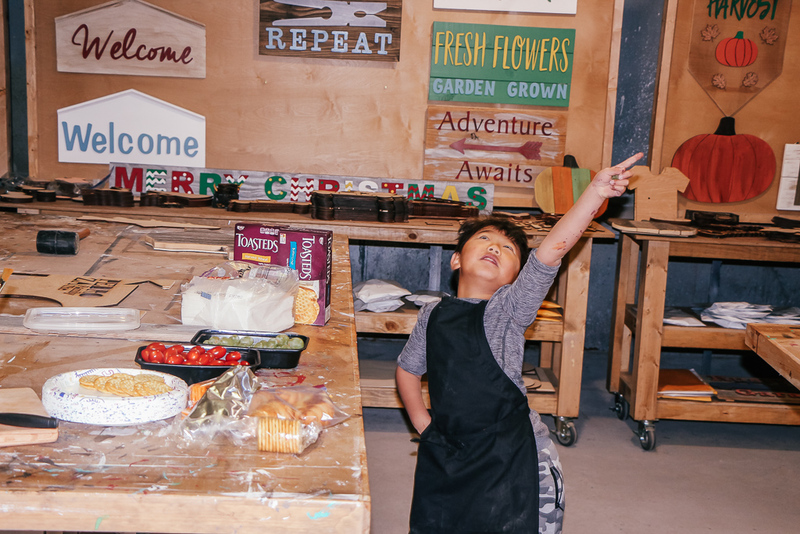 The DIY Studio Decatur is located in a large industrial building with lots of space, supplies, and tools, so what you're able to create is pretty much limitless. The wooden signs are very popular. If you like that shabby, farmhouse chic look, there's a lot of options for you. You might come in knowing exactly what kind of project you want to make or you might have absolutely no idea (raises hand.) There's lots of inspiration and Ben and Lynne are great at helping you figure out what you want. I do recommend you look up some projects on Pinterest to get some inspiration beforehand, though. There are a lot of choices once you get into the studio and it can be a little overwhelming if you have zero clue what you want to make. Excited to hang this collaboration in our home. Yes yes, I said COLLABORATION. If signs are not your thing, that's OK. The DIY Studio Decatur Texas also offers candle making, jewelry making, leatherwork, stamping, wreath making . . . and probably anything else you could dream up. You know those painting classes where you grab your friends and some wine and some snacks and make a painting under the direction of an instructor? Those are fun, but you don't have many options on the project you create. You're going to paint bluebonnets or a bowl of peaches or whatever the instructor tells you you're painting. Sure, everyone's bluebonnets or bowl of peaches is gonna look a little different, but you don't have much freedom to really flex your creativity. If getting together with your girlfriends or your family over a bottle of wine and a cheese plate and making something truly unique and making memories sounds good to you, this is something you need to check out. 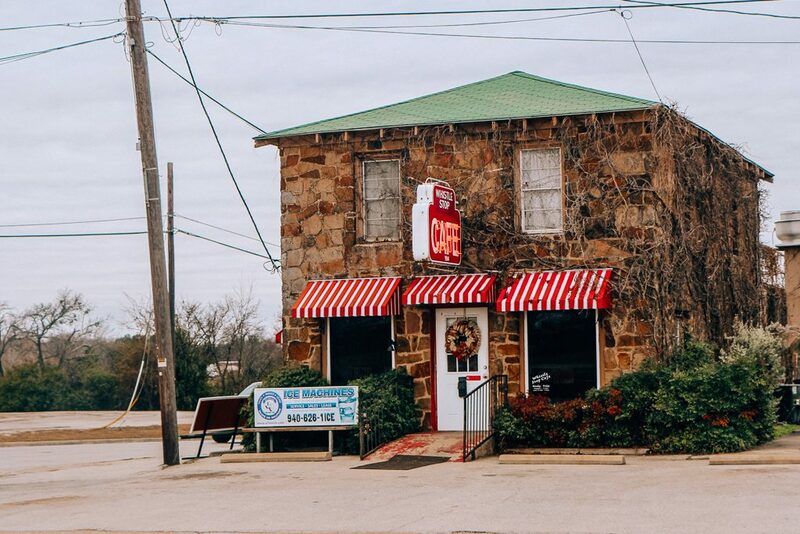 The DIY Studio Decatur is about an hour's drive from Fort Worth and right outside of Downtown Decatur, which has a whole lot of small town quirky cuteness to explore. It's absolutely doable as a day trip from the DFW area and as weekend road trip from San Antonio, Houston, or Austin. A standard class lasts about three hours with an average cost of $45 per person. The DIY Studio Decatur has the capability to do mobile classes – meaning they can come to you – although your selection of projects may be more limited. I did a class with my husband and sons and we had an amazing time. My husband and I did a project together (although if you listen to him, he did all the work…but he's totally lying) and my kids did individual projects. It was a great, unplugged time and honestly, in this day and age and in the business I'm in, my face is always on a screen. It was really nice to have this time. I found the process of staining and painting very therapeutic. There was music. There was cheese. It was a good day. Follow DIY Studio Decatur on Facebook and Instagram to see what they're up to. The Decatur Town Square is one of the most charming town squares I've ever seen. There's plenty to keep you fed, watered, and entertained, and the shopping is truly top notch…and so much fun. This is truly a city that honors it's past while looking forward. The original storefront brickwork is present all over downtown and modern offices and businesses are tucked inside the restored facades. At the center of the square is “The Pink Lady” which is a lovely pink granite courthouse built in 1896. Man, they don't make 'em like this anymore and this structure is majestic inside and out, and interesting to look at and photograph from all angles. 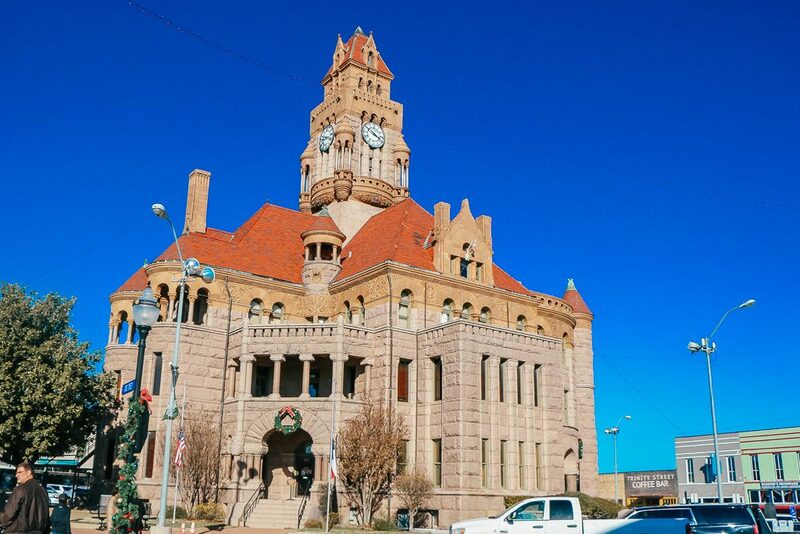 Decatur is the county seat for Wise County and their courthouse is truly a showplace…and, if you don't take a picture of it, were you really even in Decatur? If you visit Texas, you need a cowboy hat. 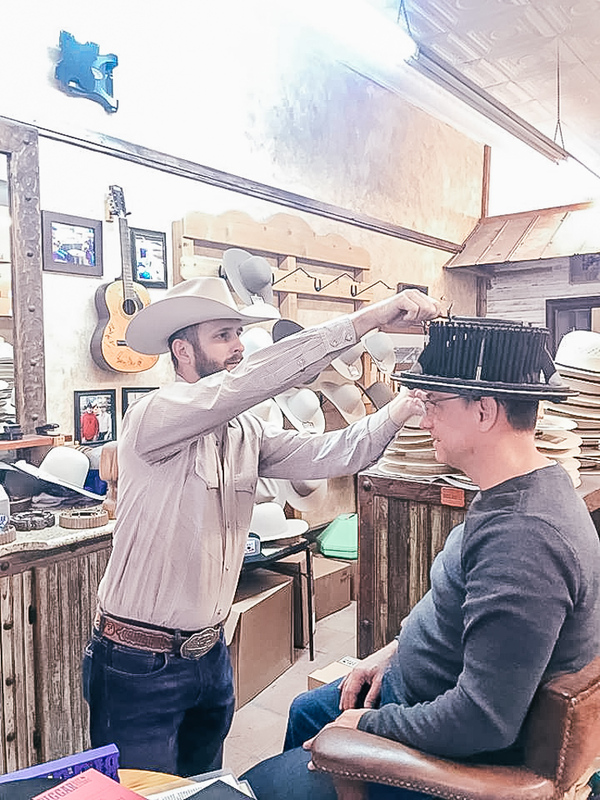 If you want a quality cowboy hat or want to learn how they're made, then you need to go to Biggar Hat Store. They offer custom made hats with craftsmanship that will truly wow you. The waiting list for one of these custom hats is 3-4 months…unless your name happens to be on the “Special Customers” list. Your Biggar hat will be a one of a kind item and yes, that sort of attention to detail and quality is reflected in the price. Also? There is a three-four month waiting list for a custom-made Biggar hat. Unless you're the president or Scarlett Johansen (yep, there were posted exceptions to the wait list) so if you'd like to order one, be prepared to pay and be prepared to wait. Or be Scarlett Johanssen. The craftsmanship that goes into these hats is exceptional. You're getting a hat you can wear on your head – that fits your head perfectly – for many, many years. My husband and I got our heads measured and learned we are both extra long ovals, which indicates superior intellect. I'm totally making that up but I had ya there for a minute, didn't I? The Divine Center of Yoga is located on the main square in Decatur. It's a lovely studio with some delicious skincare products, candles, yoga wear and other gifts offered in the out front area. I have honestly never considered finding a yoga studio to use while I'm traveling but it kind of make sense when you think about it and something I'll do in the future. We travel a ton, and whether I drive for several hours in a car or sit in one of those oh-so-lovely airline seats, I'm usually stiff and cramped and tense when I get where I'm going. Taking an hour or so to get centered when I'm on the road might be a good practice to start. If you'd like more information on The Divine Center of Yoga, click here. 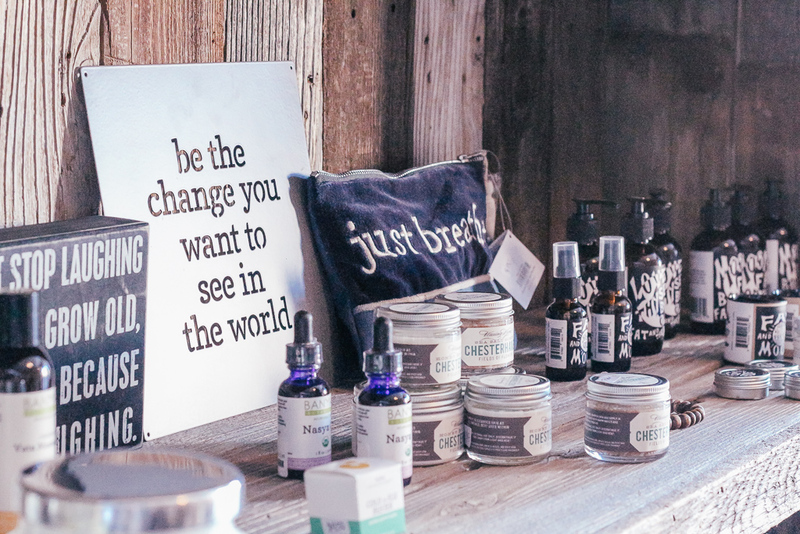 And…even if yoga isn't your thing or you can't make it fit into your visit, check out their products. They have some really fun stuff. Hey Sugar has every kind of candy imaginable, including the nostalgic candy from your childhood that you'd forgotten about. Mine were those little wax Coke bottles with sweet liquid inside. They also have a soda fountain with a variety of ice cream treats and the largest selection of retro sodas in glass bottles that I've ever seen. Trinity Street is part restaurant bar and part coffee shop. It has a distinctively “hipster” vibe but it's a place for everyone. I saw a fun mix of cowboy hats and beanies. There's a fun selection of coffee drinks and other alcoholic and non-alcoholic beverages. 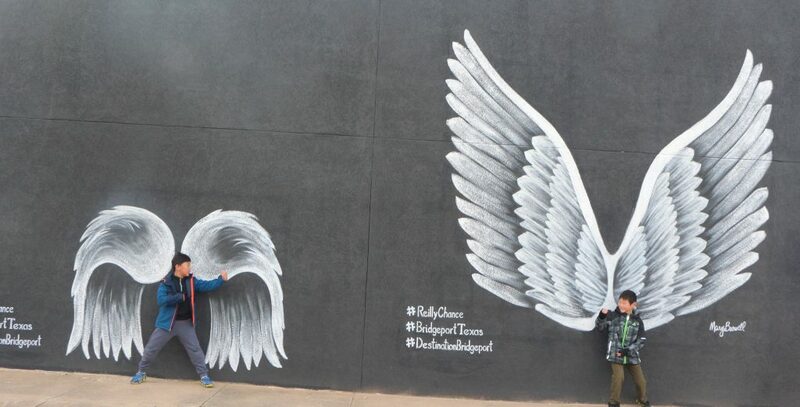 There are also a ton of cool murals in and around town…if you're planning a visit to Decatur Texas and want the “most instagrammable spots?” You might want to subscribe for updates because I know aaaaalllll of them and will be sharing them soon. There's more than what you see in this post, hint-hint, so keep checking back. And don't forget the Decatur Visitor's Center, located in the old post office. It's a lovely historic building and the staff inside will provide you tons of info on what's going on in town and places to check out that might not be on your radar. There's also a self-service rack of brochures in the back of the building if you stop by during non-business hours. There are lots of stores that sell gifts and home items in Decatur, but this is the only one I spent real time in. You can't miss the iconic Majestic Theater sign…the store is right under that. 287 is an amazing, open space with all kinds of fun goodies, from home furnishings to jewelry to gifts. I seriously wanted one of everything in this store. It was so much fun. You can check out their Facebook page here…and definitely stop in when you come to town. Although this is technically in the nearby city of Bridgeport, you should definitely consider adding a this to your Decatur plans. C.A.R.E. stands for Center for Animal Research and Education and is home to approximately 50 animals, mostly big cats but there are a few other species mixed in as well, to include lemurs, llamas, and a tortoise. 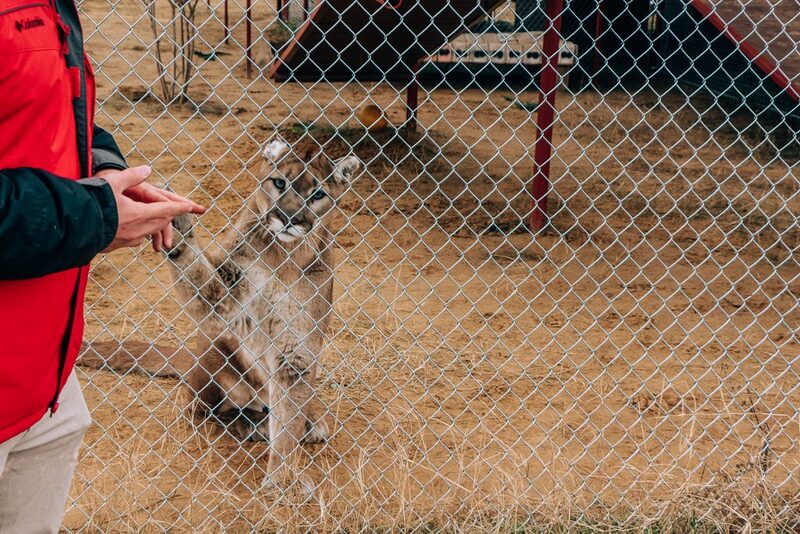 CARE's mission is to provide for a safe, permanent and loving home to exotic animals in need. CARE focuses on excellence in physical and emotional care, advocating animal welfare through education, and conducting minimally-invasive research that will improve living conditions for captive animal populations world-wide. Many of the animals in residence at CARE are transfers from other facilities or private zoos and some were formerly kept as pets…and as awesome as having a pet baby leopard might sound, it is a bad, bad idea. Your kids are very safe here but this shows the distance between the guests and the animal habitat. The guy in the red was our tour guide and the rule is, you have to stay behind the tour guide at all times. While CARE is not a zoo, tours are available. Learning about these animals and seeing them up close is an experience I can only describe as breathtaking but it's also very educational and eye-opening. 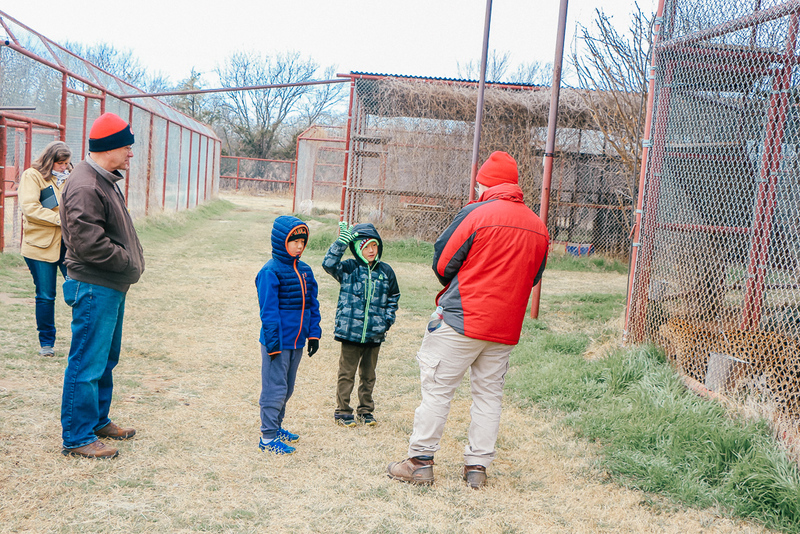 My boys are eight and they're curious about and interested in animals and it was an amazing opportunity for them to have this level of experience with lions and tigers…no bears, sorry, but there are cougars and bobcats that more than make up for that. 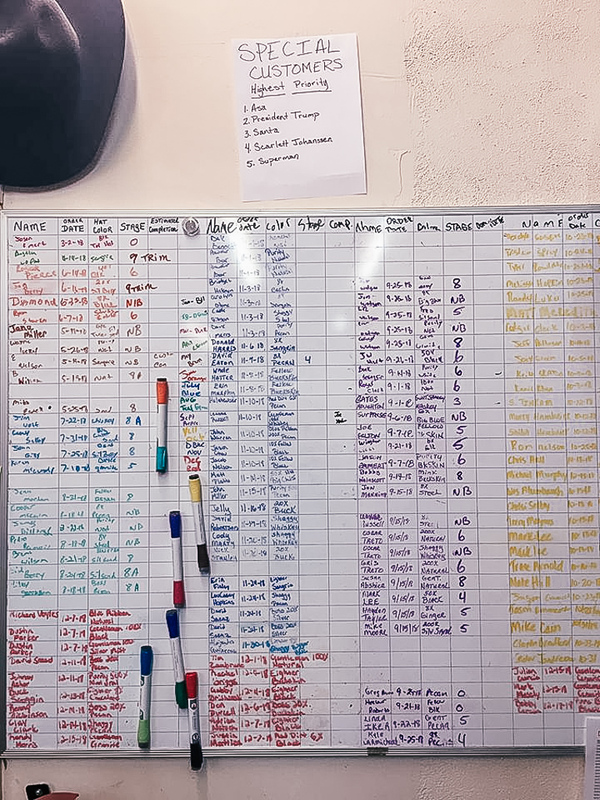 CARE is manned by paid staff and a number of volunteers and they're funded solely by donations. Their philosophy is very animal centered and the respect everyone I came in contact had for these beautiful beasts was evident from the time we stepped onto the property until we left. CARE is a 501©(3) non-profit organization which means they're solely funded by donations and private sponsorships. This is Solano and if it looks like he's missing an eye, that's because he is. 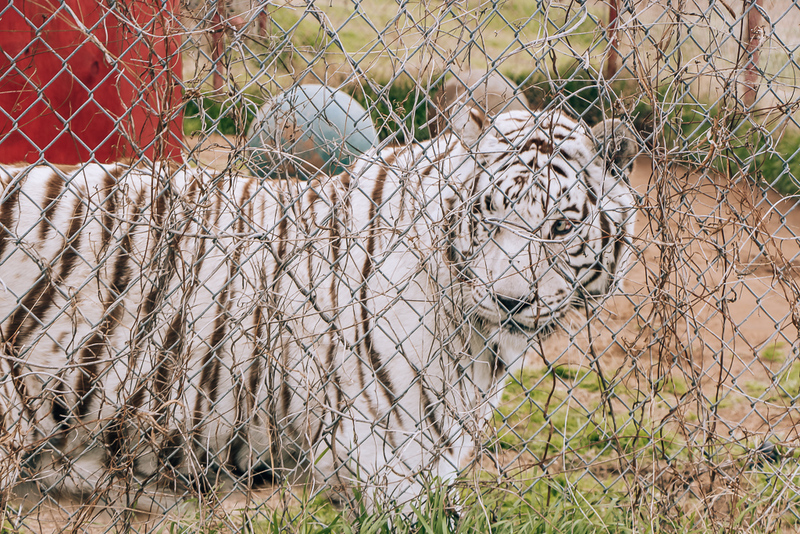 White Tigers have a high instance of Melanoma…a tumor is the reason he lost his eye. You can take a tour of CARE every Saturday and Sunday at 11am, 1pm, and 3pm. Tours last approximately 90-minutes and there's a suggested donation of $20 per person. Yes, that's way more than what you'd spend on a day at the zoo but this is not a day at the zoo. You'll get to see these animals from an intimate perspective and learn way more than you would at any zoo. The tour is walking intensive and there aren't really any sitting spots, so be prepared to be on your feet the entire time…although it will go quickly. Guests younger than 7-years-old aren't permitted, and honestly? I get this. My boys were eight and we were on a private tour, meaning our group size was very small. They had four adults plus our tour guide to keep watch over them to make sure they didn't wander off or stick their fingers inside the animal habitats. The big cats were very interested in my boys because they're close to the size of their prey. The mountain lions, Apollo and Lakai were totally scoping them out as appetizers…we were completely safe but we were very, very close to these beautiful cats. My boys had an amazing experience but I'd definitely use your best judgement and caution on taking younger kids. They need to be able to pay attention and follow directions, and be on their feet for 90 minutes+. They also need to be relatively calm and chilled out kids…or at least have the ability to be calm and chilled out for the tour. There's a lot of open space at CARE but your kids can't run around and make a bunch of noise that would disturb the animals. This is Lakai, who is originally from Canada (if he looks like he's missing part of his year, he is. He lost it due to frostbite. Lakai's home for many years was the Dallas Zoo and was moved to CARE after the zoo decided to close the enclosure he lives in. And yep…he totally had his sights on my kids. And if this couldn't get any cooler, you can spend the night at CARE (adults only.) Does a luxurious room towering 16 feet above tiger and lion enclosures sound good to you. The only acceptable answer is YASSSS. You'll be able to see lions from your bedroom window and tigers, cougars, and lemurs from your semi-private terrace…don't worry, you are perfectly safe. You'll also get the chance to see behind the scenes feedings and night time tours of the lions, tigers, leopards, cougars, lemurs and more. You'll also have personal, 24-hour concierge and guide service. Breakfast and dinner are included. Contact CARE directly if you're interested in setting this up. And yes, you ARE interested. Yep, you guessed it. My new bucket list item. Who wants to keep my kids for a couple of days? If you'd like to learn more about CARE, check out their website or follow them on Facebook and Instagram. 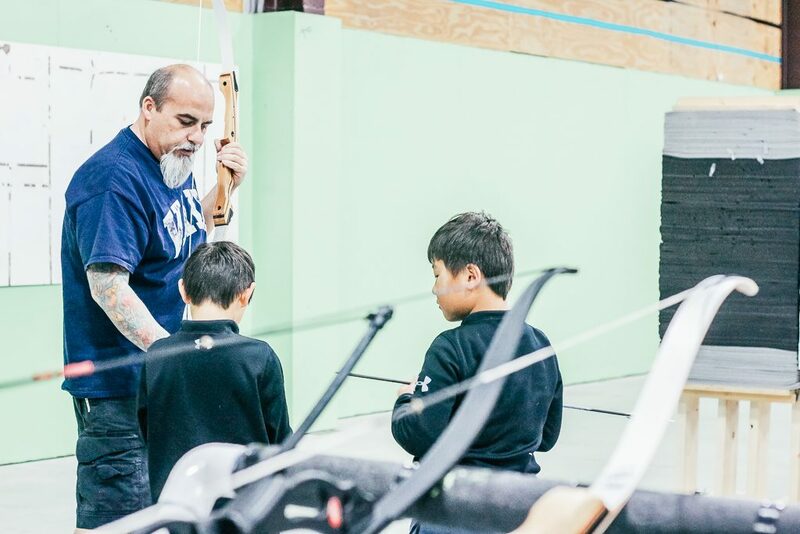 If you're looking for an indoor activity to do with kids, check out Nock it Archery Center. Whether you're a pro with a bow and arrow or a total newbie, you'll have fun here. We spent a couple of hours here that felt like 10 minutes. We'd shot with bows and arrows a couple of times before but this experience was 100 times better. The owner was awesome and spent a lot of time working with my kids, particularly Zack who has a limb difference. When he'd shot bows and arrows before, he's used some adaptive equipment. This time, he was able to shoot the “regular way.” He had to work a little harder and handle the bow just a little differently. Nock it Archery Center is something just about anyone can enjoy. I recommend calling before you plan to visit just to make sure they have availability or to see if any special offers or events apply. You can get their contact info through their Facebook page. They're on Instagram as well. If you want to venture a little beyond Decatur, check out nearby Bridgeport. We stopped here for lunch after a morning at the Tiger Sanctuary and had a brief look at the downtown area, which is adorable. 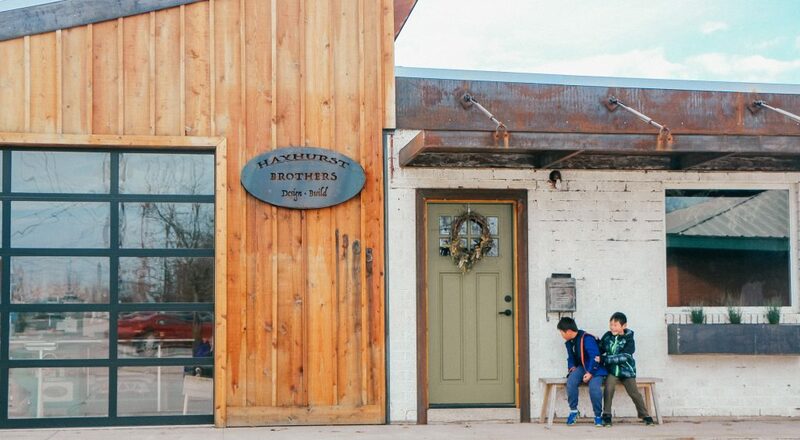 If you're a fan of Texas Flip n' Move, The Hayhurst Brothers have a store there. It was closed when we stopped by (womp womp womp) but it was fun to explore a little bit of Bridgeport. When you tell your kids to stand in front of the angel wings and look angelic. NRS stands for National Roping Supply. At first glance, this looks like a giant western wear and tack store…and it definitely is that, but make sure you put the NRS Ranch on the list of your things to do in Decatur Texas. You can spend as much or as little time looking around, but I'd allow at least a couple of hours to get a good look, more if there's something going on in the arena. We didn't get to see any arena events on the day we visited but I know my two little city slickers would have absolutely loved seeing a roping event. You can check out a free golf cart and explore the ranch at your leisure. All you have to do is exchange your driver's license to a key and the the golf cart is yours to explore with. How cool is that. There's also a free Ranch Store Museum where you can learn about Trevor Brazile and Roy Cooper, both legendary cowboys. And, if your visit to this part of Texas inspires you to “dress the part” then you can hook yourself right up. If you want to stay a little longer, there are cabins and bunkhouses available for rent. More on the NRS Ranch and all that it offers here. You can also follow on Facebook and Instagram. Seriously don't miss this one. I wouldn't have thought to stop in a roping supply store with my family but I'm so glad our hosts took us here. There is definitely more than you think to do and see. 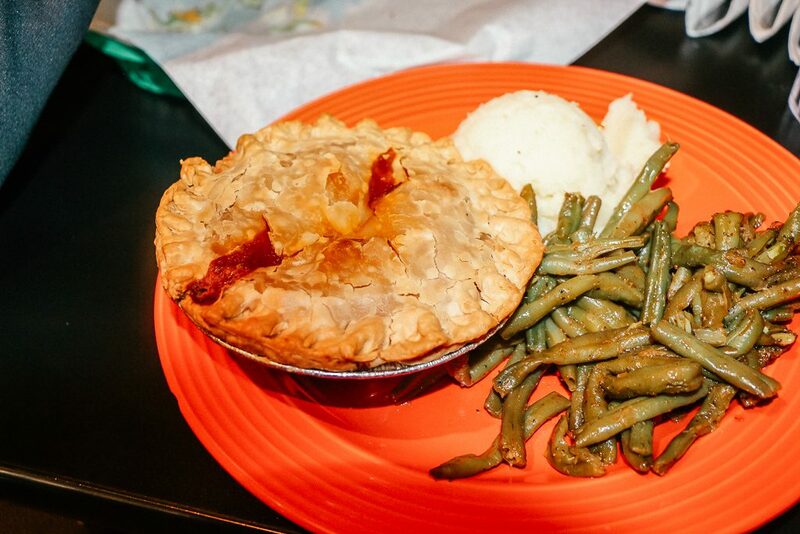 The Whistle Stop Cafe is an American restaurant that serves home style food and a little bit of everything. Unfortunately, they don't have their menu posted online (if I'd have known that, I would have snagged one). I can recommend the chicken fried chicken (my husband and I both ate this) and the child's chicken quesadillas with homemade tortilla chips. I've also heard they have good tacos and pie. There's not a ton of seating inside, so be prepared to wait. Also, they're closed on Saturday's and Sundays. Perhaps more important than the food are the many iconic picture spots you'll find outside. 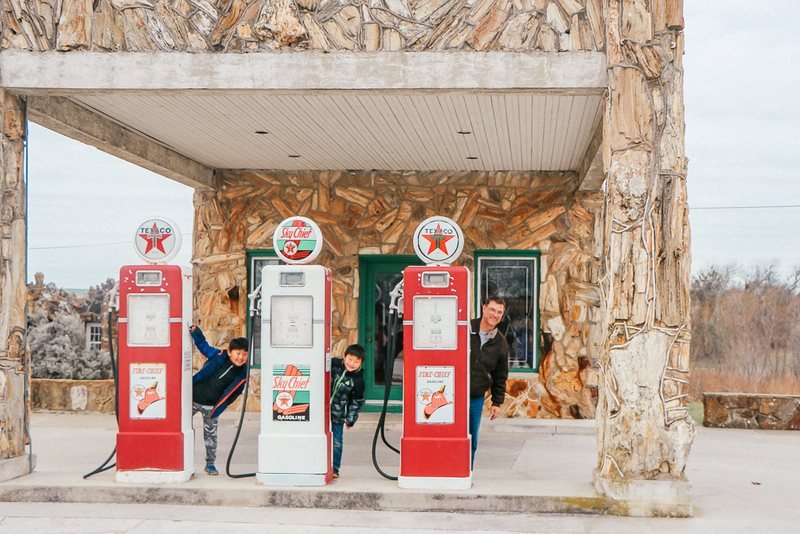 The Petrified Wood Gas Station is an awesome photo spot, as is the front of the cafe. Even if you're in town for the weekend and miss eating here, I recommend popping by for a picture…and there will be less crowds when the cafe isn't open so you won't get people's cars in your picture. Eating at Sweetie Pie's Ribeyes is a treat. If you like a good steak, this is your place. While they do have a few things other than steaks, this isn't really a place for vegetarians, so if that's you, I'd advise you to choose something else, although I'm sure they're able to accommodate you if you ask. Just be aware that it's definitely geared towards carnivores. My husband and I both had the 9 oz Ribeye with a baked potato. Their bread service is also really, really good. Our kids had the macaroni and cheese and it came in a bowl made of their homemade bread, which the menu doesn't specify, so that was a nice surprise and possibly an option if you don't want meat. And, while their menu online lists some delicious sounding desserts, it doesn't list the cookie sundae and the apple pie served on a sizzling skillet with brandy butter sauce that we enjoyed so I am guessing there have been some updates. We thoroughly enjoyed our food and service. At one point during our meal, our waitress took a microphone and walked around the restaurant singing a song. It was completely unexpected and delightful. I do note their lunch menu contains some lighter items…I'm not sure if they'd make a burger or one of their salads for a dinner guest, but you could always ask. More on Sweetie Pie's here. All the food we ate in Decatur was delicious, but I think Rooster's Roadhouse was my favorite meal. The atmosphere is loud and fun…almost bar-like but it's most definitely a family friendly restaurant. There is upstairs and downstairs seating and lots and lots of fun decor. 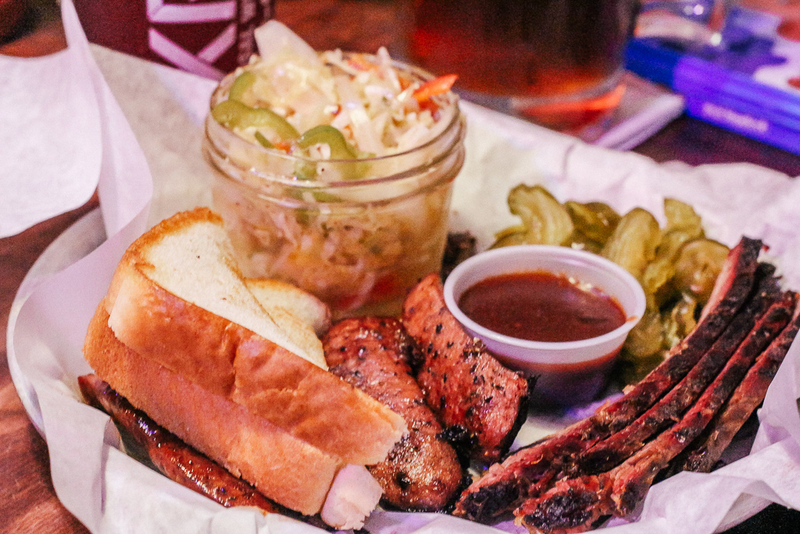 It's a noisy and fun atmosphere with great service and a menu that includes lots of Texas favorites. If you like to combine your eating with thrillseeking, the appetizer menu includes something called a Hell Burger that you have to be 18 years or older to try (after you sign a waiver.) 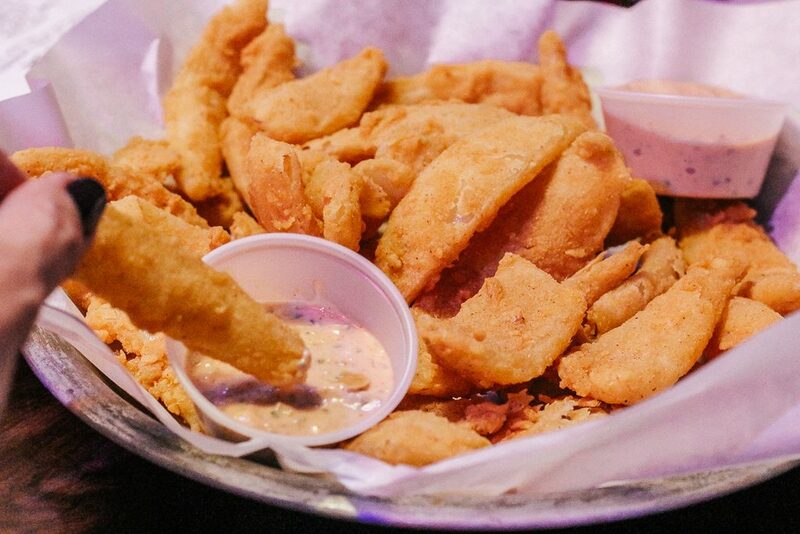 We gave that one a hard pass but if you want to walk on the wild side a little (after you absolve the restaurant of any responsibility for your digestive woes later) then you have that option. 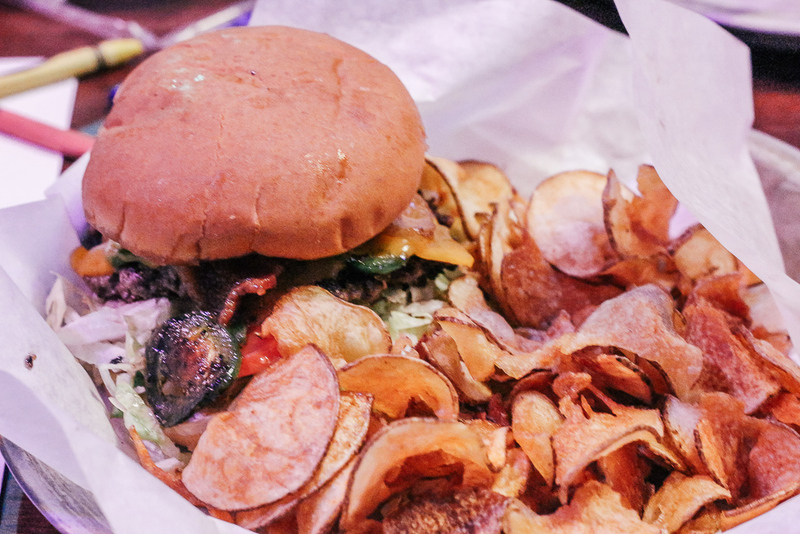 They offer a variety of salads, sandwiches, burgers and BBQ. My husband had the two-meat BBQ plate and I had the smoked garlic bacon and jalepeno cheeseburger. I love all of those things and sometimes, you just want a good burger. This one didn't disappoint. The menu mentions “jelly jar desserts” but we were pretty done after the Rooster Tails and our dinners. There's also a kids menu that's printed on an activity sheet that we didn't save. 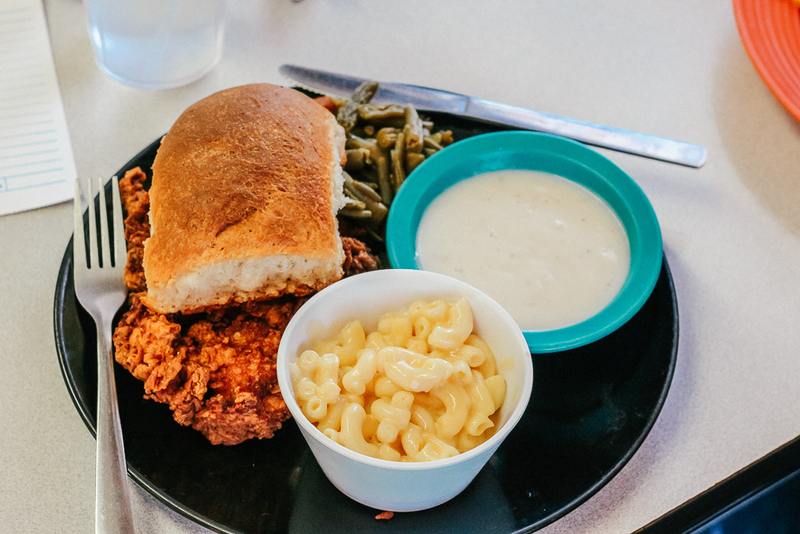 They offered the basics: macaroni and cheese, chicken fingers, and sloppy joes. More about Rooster's Roadhouse here. They also have a sister location in nearby Denton. I mentioned Trinity Street Coffee Bar above. It's a great place to get a drink or a coffee but they also serve a limited menu from Roosters Roadhouse, which is right next door. Five Boys Ranch is in nearby Bridgeport. They don't have a website but you can keep up with their happenings on Facebook. 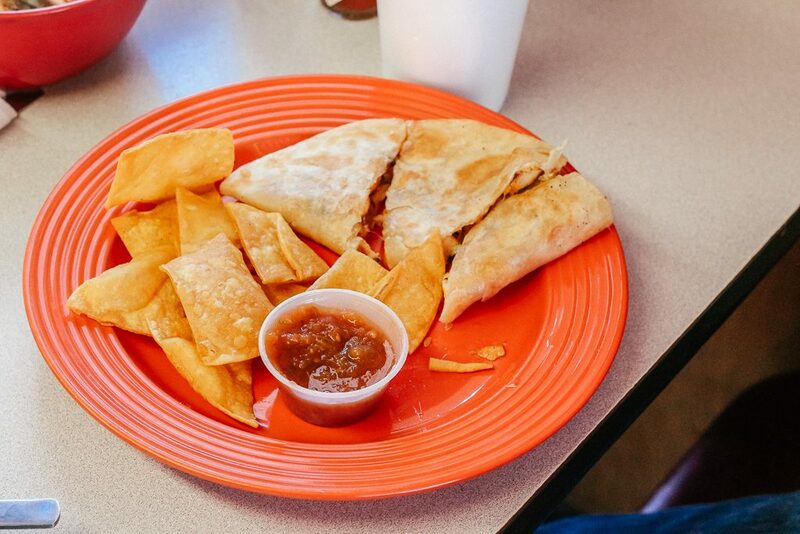 They offer burgers, tacos, breakfast items and other homestyle favorites. I had the brisket pot pie because it sounded good and I've never seen brisket pot pie on any menu anywhere. I'd been out in the cold all morning and it was a great hearty and warming lunch. It did not disappoint. 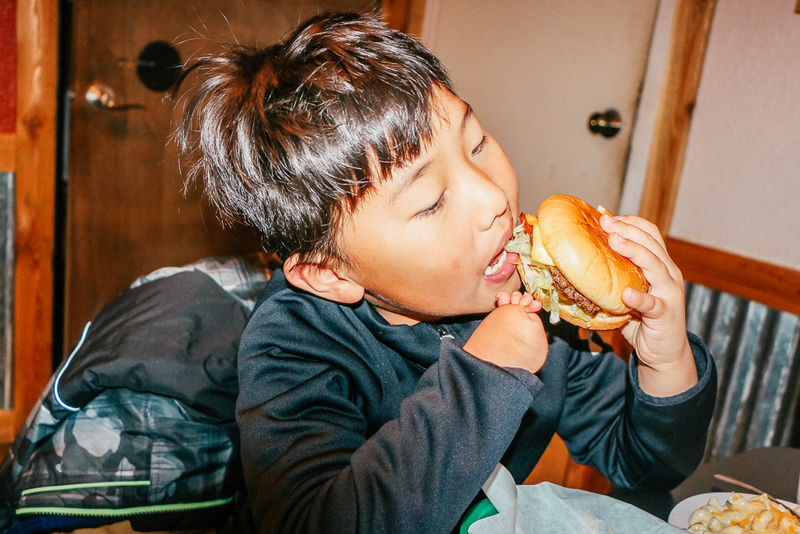 My husband and the boys had burgers and everyone devoured everything. I definitely recommend. There's also a food truck parked out back, so if you see it somewhere in Texas, give them a try. Although not a restaurant, I did want to mention Marker Cellars located in nearby Alvord Texas. They do have cheese plates for purchase and you can bring your own picnic and enjoy it on the grounds. 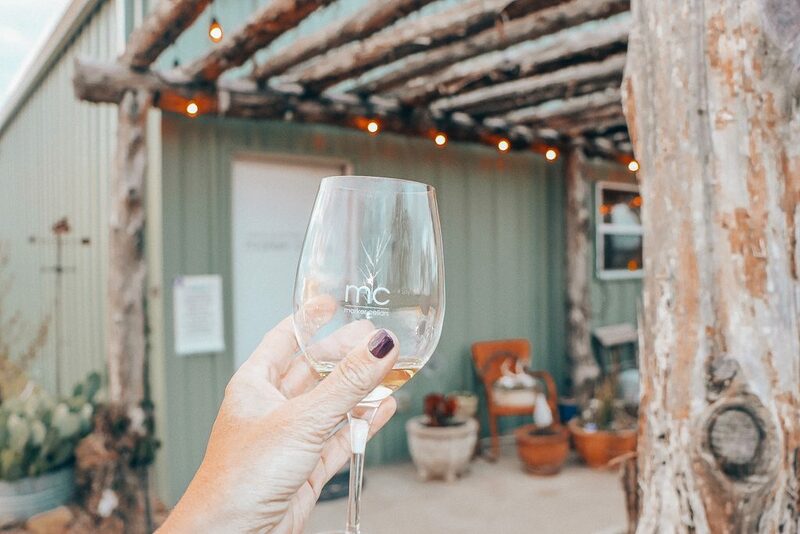 Marker Cellars is kid and pet friendly, so if you're passing through and love wine, you'll definitely want to create some room in your schedule to stop by. If you live in the DFW or surrounding area, this is a great place for a Day Trip. If you live elsewhere in Texas, this is a great place for a weekend. Our home in San Antonio is about a four hour drive away, which is totally do-able for a weekend. Decatur is also a really fun meeting point for people who are looking for a central meeting point. If you want to plan a girlfriend's reunion, a writing retreat (don't think I haven't thought about THAT one) or a meetup place for anyone in any kind of long distance relationship, this is a place to consider. 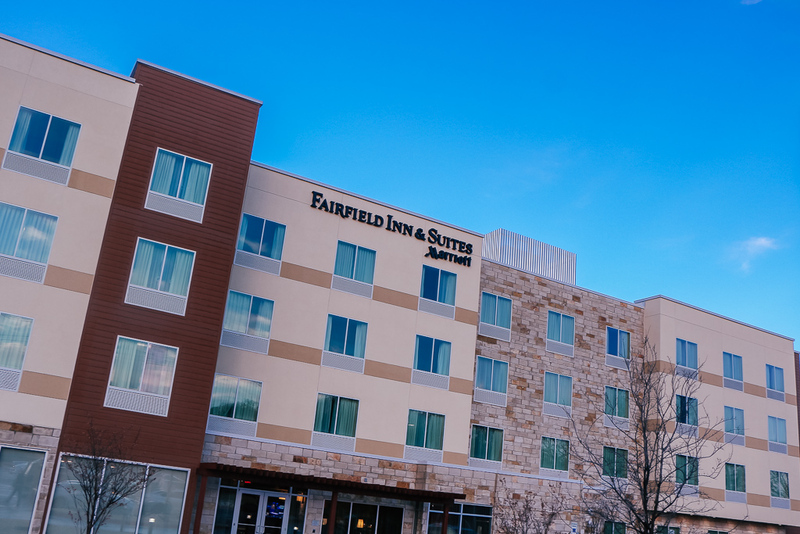 I have to say…I've never really had a bad experience at a Fairfield Inn but this one was extra awesome. It appears to be a newer (or at least remodeled) space and the staff was always present and always smiling and friendly. Their fitness center was also pristine and the equipment all looked shiny and brand new…probably because people like me are too busy eating and having fun to use it. Decatur Texas is an easy drive from the Dallas Fort Worth airport, and you can pretty much fly anywhere in the world directly into DFW. It's the halfway point between San Antonio and Denver. There's more than plenty to keep you occupied for a long weekend or longer and lots of possibilities. So…when are you going? If you're interested in learning more about Decatur or want to see what's happening in town when you'll be visiting, check out this website. More about the DIY Studio Decatur HERE. Great article about my hometown!! Next time, be sure to visit the Wise County Heritage Museum which is housed in the old Decatur Baptist College Ad building. Thanks for your very positive and informative article!! !